Amongst the tragedy and ruin of last weeks Christchurch earthquake it hasn’t taken long for the blame game to emerge. Watching and reading the popular media over the last few days it is obvious that they want someone to publically flog for the terrible collapse of the PCG building and the CTV building. Fortunately the Department of Building and Housing have already stated that their investigation will focus on finding the facts and it does not address areas of blame. That is the logical first step. If after that there are things that can be learnt, then that is good. If it is found someone was negligent than that needs to be addressed separately, in the fullness of time. However, I don’t believe that trying to find a blame hound now is very constructive. I am not a Structural Engineer, so this is my opinion as an Architect, and below are a few relevant points as I see them, in order to provide some context. Apart from the historic buildings, the two collapsed buildings were reported in the Dominion Post as being built in the 60s and 70s, and it is reasonable to believe that they were built to the relevant structural standards of the time. In work our practice has done in the past few years, it has been identified that the structural standards for earthquake resistance has increased 3 fold since that time. The structural design and design loadings standard NZS 4203 was first dated 1976, then 1984 and 1992. In the last few years AS/NZS 1170 has replaced 4203 and the structural requirements for earthquake resistance jumped up quite significantly in some aspects. I know of one significant building in the Wellington CBD that was extensively retrofitted in the early 1980s to resist earthquake loads, at a cost of many millions of dollars at that time. Despite that work, the building has recently been assessed as being earthquake prone against current standards. The current owners are now spending much more to retrofit more extensive bracing and strengthening measures. The often quoted ’Magnitude’ scale for earthquakes — as in magnitude 7.1 — gives a measure of the energy released by an earthquake, which is helpful in determining comparative size. 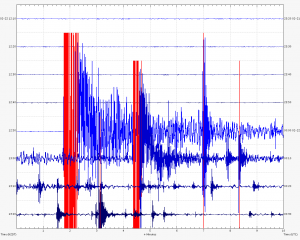 However it does not indicate the shaking force or how violent a given quake is. The general media appear to be stumped as to why a magnitude 6.3 quake produced so much more damage than a 7.1 quake. Apart from depth and location, the reason is ground acceleration. We discovered the difference when we were designing a laboratory that you really don’t want to fall down when the big one hits. During the design phase the client asked what magnitude quake the building would resist. Oh, if only it were that easy sir, replies the structural engineer. What the structural standards refer to is ground acceleration. How fast the ground moves determines how strong the building on top needs to be to either move with the ground or to resist falling over until the ground comes back to about the same location. However, if the ground is not just going side to side but up and down as well, then it becomes increasingly harder to hold the big heavy hollow object together. Referring to data from the Geonet.org.nz web site it shows that during the September 4 quake the ground acceleration in Christchurch central was between 0.1g and 0.32g. g being the force of gravity. In the February 22 quake the force was between 0.57 and 0.80g in the CBD area. The highest shaking was recorded at Heathcote Valley Primary School at 2.2g, with readings of 1.88g at Pages Road Pumping Station and 1.07g at Hulverstone Drive Pumping Station!!. For some perspective on this, a Formula One car accelerates at about 1.4g. Buildings don’t. Those are huge forces in any language. Just in the CBD alone the ground acceleration was 2 to 3 times as great for a quake that was almost 1 order of magnitude less. The map for the September quake is here and the February quake is here. Early indications are that the Port Hills are now 400mm higher than before, meaning that the reverse faulting mechanism thrust the ground up some distance. In short, as we wait to see what the technical reasons are for the two major collapses, the fact of the matter is that there is a point where we can not resist all of the forces of nature. It is possible that the structural loading standards will be modified yet again as a result of the reviews to come. However you can only build to what is anticipated to be the likely expected ground acceleration. Before our places of shelter become — to quote Edmund Blackadder ’a small windowless building’.